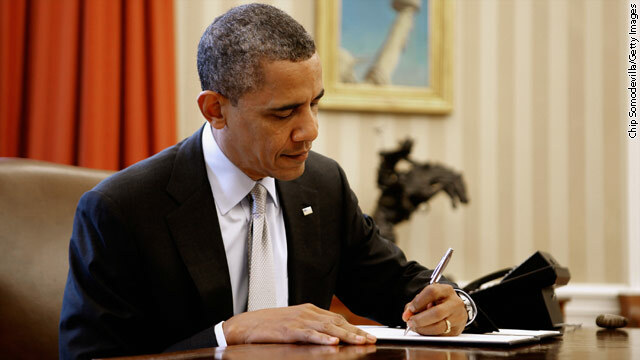 President Barack Obama signs a proclamation to designate federal lands within the former Fort Ord as a national monument in the Oval Office of the White House April 20, 2012 in Washington, DC. California outdoor enthusiasts take heart. On Friday President Barack Obama signed a proclamation designating Fort Ord on California’s Monterey Peninsula as a National Monument under the Antiquities Act. “Fort Ord’s dramatic landscape lives in the memories of thousands of veterans as their first taste of Army life, as a final stop before deploying to war, or as a home base during their military career. This national monument will not only protect one of the crown jewels of California’s coast, but will also honor the heroism and dedication of men and women who served our nation and fought in the major conflicts of the 20th century,” Obama said in a statement. By 2019, the Bureau of Land Management – a division of the Department of the Interior – will more than double the approximately 7,200 acres of land in the Fort Ord area that is already under its management authority. The transfer of additional land from the Army was scheduled under an existing base closure agreement and will come after the completion of an ongoing clean-up operation. By designating the land as a national monument, it enters the BLM’s National Land Conservation System, which includes 27 million acres of protected federal land. On a conference call with reporters Friday, Secretary of the Interior Ken Salazar and BLM Director Bob Abbey outlined some of the broader benefits of today’s proclamation. Abbey pointed out that the area currently hosts more than 100,000 visitors annually, and is a key part of one of the largest bicycling events in the world – the Sea Otter Classic – which involves more than 10,000 athletes and 50,000 spectators. Although it’s unlikely the BLM will add many new jobs to handle management of the additional land, Salazar argued that independent studies show that the department’s ongoing conservation efforts create jobs in the aggregate. “In a broad sense this is very much rooted in the president's economy and jobs priority for the nation,” Salazar said. The Fort Ord area was originally established in 1917 as Camp Gigling and was used primarily as a military training base. It was renamed Camp Ord in 1939 and then Fort Ord in 1940. For nearly three decades from the late 1940’s to the 1970’s, Fort Ord served as a basic training site, and in 1975 it became home to the 7th Infantry Division (Light). The 1991 independent base closing commission recommended that Fort Ord be closed and the 7th Infantry Division be relocated to Fort Lewis, Washington. For Ord was officially closed in September of 1994.
good job mr president. Obama 2012 Beautiful area. Ft. Ord itself is pretty UNattractive, but Monterey and Pacific Grove is pretty nice. I am so happy Fort Ord is being taken care of the way it should be. I was stationed there twice during the 1980's and I enjoyed serving my country during this period. Being stationed there once wasn't enough. I was very fortunate to have the opportunity to be stationed there. The surrounding communities were awesome then and I am sure they continue to be the same now. I hope to return there in the near future. Many thanks to President Obama and his administration for the proclamation. It was going to be named a National Monument regardless of who the president was, all Obama did was sign his name. You might be right but give a little credit! What's your point? Isn't that what presidents do or are you upset because Pres. OBAMA signed it? When a President can spend the funds to establish a national park when his country is currently $15.5 trillion dollars in debt and not take care of those who are suffering astonishes me. No, let me rephrase that, it pisses me off! ROMNEY CAN'T SIGN IT. HAHAHAHAHA!!! Yea...right....And George Bush only had to sign his name on the dotted line proclaiming, "Mission accomplished", without ever capturing Osama Bin Laden..
And he does his on the heals of denying a request by Gov. Fallon of Oklahoma for Federal Disaster Aid. This is the second time Pres. Obama has denied a request for Federal Disaster Aid to support the lives of families tragically affected by severe storms. First in Clermont County, Ohio and now Woodward Co, OK. Is it any coincidence both of these states have Republican governors? How is it that Oklahoma's denial comes just two days after Mitt Romney mentions our Governor may be a possible running mate for Vice President? So, this is going to be his legacy... A National Monument. Rebuilding America would have left a greater impact. Even if only in the aftermath of a storm. He can sign this BS government land grabs but he can't sign a document to build a pipe line and put folks to work, reduce energy independance and help the US balance of trade. Obama is a shill and a total waste. No to Gordon Gekko for president. Saw Little Richard perform at the Ord Soldiers Club in '56. Beautiful spot on Monterey Bay. As in the hole as we are wonder why they didn't sell it to developers?